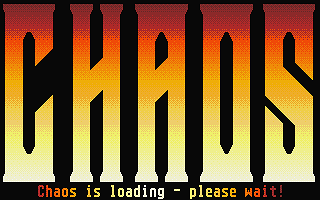 This is a fantastic game that I only discovered a few years ago (long after my STs have been in storage) There is a fairly modern remake called Chaos Funk that is easily searchable, but I still prefer this version. [no publisher] (version [512k]) (). (with two wizards) to half an hour (with eight wizards). 1 and 8 (8 being hardest), which governs how strong the wizard is. random name from the many names stored in memory. cast (if any). 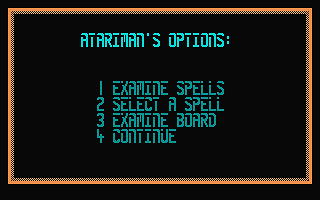 There are 4 options available to every wizard. Select a spell from the list and you are given details about it. an illusion or not (see below). cast (going diagonally costs 1.5 movement points). want, and press S to cast the spell. Press K or 0 to abort the spell. no creation is selected will abandon the current game. 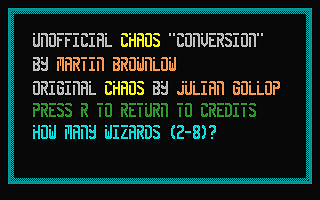 Press  1 to 8  to highlight  the respective  wizard's  creations. you the creature's movement points. Movement is acheived using the cursor keys. 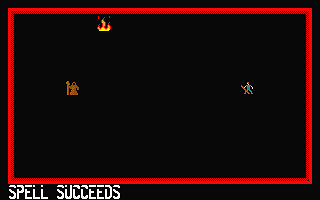 creature to move and press S.
enemy creature (within range) and fire at it by pressing S.
or during movement. K also aborts ranged fire. 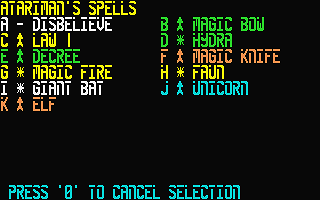 shown on the spell menu by the following symbols. 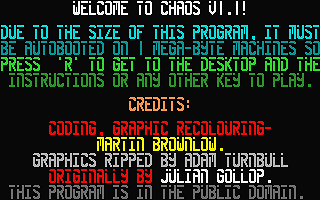 the main menu under the wizard's name e.g. dragon. The more  powerful the spell,  the lower the chance. ons but may then be disbelieved,by use of a Disbelieve spell. MANOEUVRE RATING:	Ability to disengage from an enemy. spells or wizards  with magical weapons. remain in your spell list. GOOEY BLOB (LOS):  The gooey blob cannot be cast on another creature. trapped until the blob holding them is killed. MAGIC FIRE (LOS):  The magic fire cannot be cast on another creature. placed in empty spaces and are  not adjacent to another tree. move but can attack creatures next to them. enter or move through a wall. attacks anything, these effects disappear. three attacks, Justice and Vengeance both give just one. as any other UNDEAD,but retaining its other skills. being ridden are immune to this spell. er) taking up about 700K of memory. to re-enter a name and keypad movement for foreign keyboards. And anyone who's ever played and enjoyed one of my games!